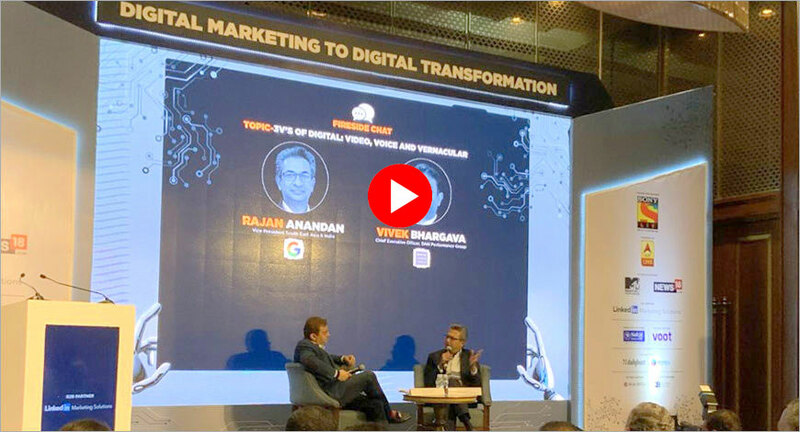 Rajan Anandan, Vice President, South East Asia and India, Google, set the tone for the launch of the third annual Dentsu Aegis Network exchange4media Digital Report in a fireside chat with Vivek Bhargava, CEO, Dentsu Aegis Network, Performance Group. He pointed out that video which has been perceived as a brand-building medium is becoming a very important performance medium. “YouTube has specific offerings that make YouTube not just a brand-building medium but also a performance medium where you can drive app downloads and sales on e-commerce etc. So in my view, if you are a performance agency you are very well placed to break into what would have been a brand business. We have case studies in India where YouTube for Performance is delivering better CPAs than Search for transaction driven businesses. Today, YouTube has more impressions than any single television channel. Six months ago a brand received 1.4 billion impressions in one day and that has grown dramatically since then,” he said. Anandan said that to truly harness the power of the Internet to reach the non-English speaking Internet users agencies and marketers will need to make creatives in local languages. “I see a lot of English ads on non-English content. What we need with vernacular is creatives in local languages. Today, there is a 50 per cent probability that if you are showing an English ad, the person who is watching it does not understand it. The second aspect, the digital asset be that the website, app, landing page or a transaction page has to be in the local language. If the whole online consumer journey is in a local language, conversion rates can more than double,” he explained.